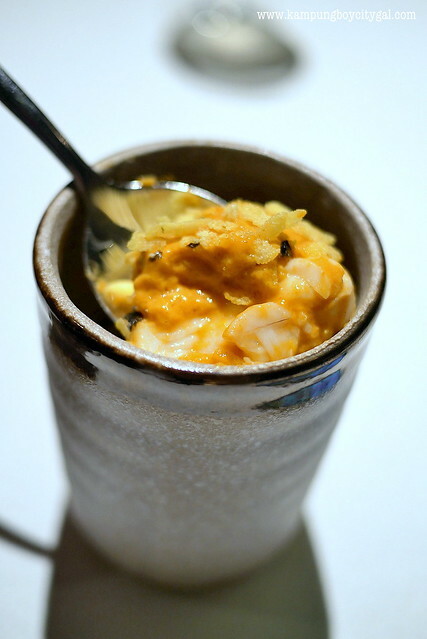 Nadodi KL is definitely one of the most talked restaurants in KL last year (in a good way). 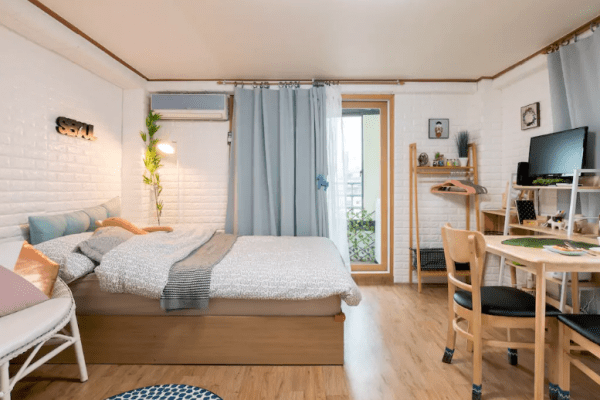 It is discreetly located a stones throw away from the Petronas Twin Towers – on the 1st Floor above The Mayang Club at 183 Jalan Mayang – right at the intersection of Jalan Yap Kwan Seng. Nadodi also means nomad or wanderer in Malayalam. The cuisine is described as engaging and nomadic, as it’s inspired by journeys from Tamil Nadu to Kerala and all the way to Sri Lanka. 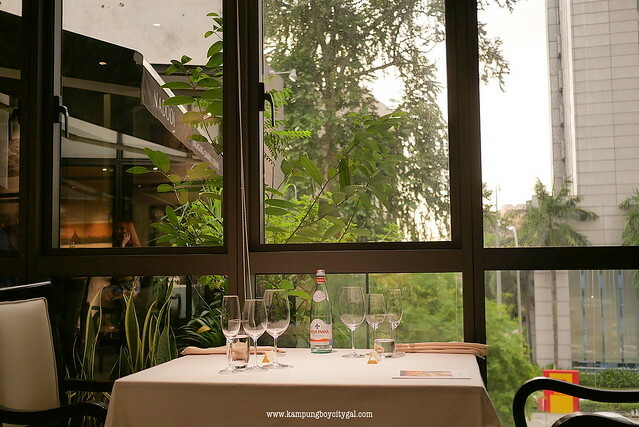 We were invited to experience a Champagne Salon & Delamotte Pairing Dinner here and our dinner was a custom 11-course menu called 11-mile journey. Nadodi offers two set of menus – 13-mile journey and 15-mile journey for RM460++ and RM490++. Salon is a unique champagne in the sense that it was originally the product of one single man, Aime Salon; from one single region, the Côte des Blancs. The wine produced here is rare on all counts: always a single harvest, single cru, single grape variety and, to complete the singularity in this wine, it is only produced in the best vintages. In Salon’s case, there’s only one single vintage, with no blending whatsoever. The result is a perfectly balanced champagne, with rich and complex aromas. It is easily compared in its fullness and richness to the great wines of Burgundy. Hence, Salon is the most sought-after champagne among connoisseurs. Champagne Delamotte is the ancient neighbour and sister to Salon. Its grapes are sourced from vineyards in the Côte des Blancs region of Champagne as those of the prestigious House of Salon. While Salon exclusively produces vintage Champagne—and only in extraordinary years—Delamotte regularly produces non-vintage Brut, Blanc de Blancs and Rosé varieties. Both houses have been under the direction of Didier Depond in Le Mesnil-sur-Oger since 1988. We were lucky to be able to meet Didier Depond during the dinner. 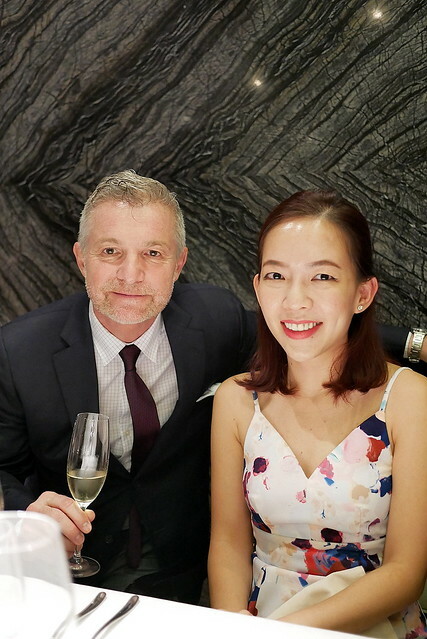 He is definitely a man of passion and compassion and has done a really good job in developing the outstanding image of these two exceptional champagnes. We started off with a Delamotte Blanc de Blancs non vintage. A delicate wine, it’s subtly fruity, with an enticing floral character. 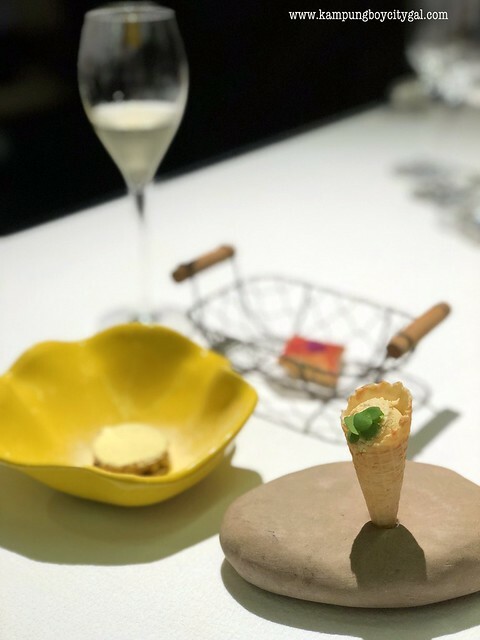 We had three bite size courses – cone, manga and pillow to go with the Delamotte Blanc de Blancs NV. 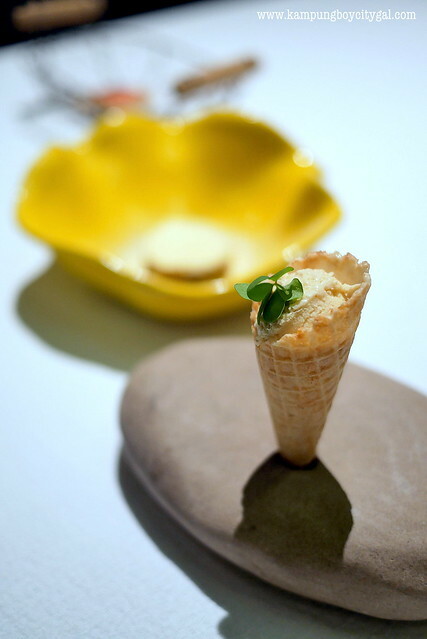 Cone is made of sambar and onion chutney. 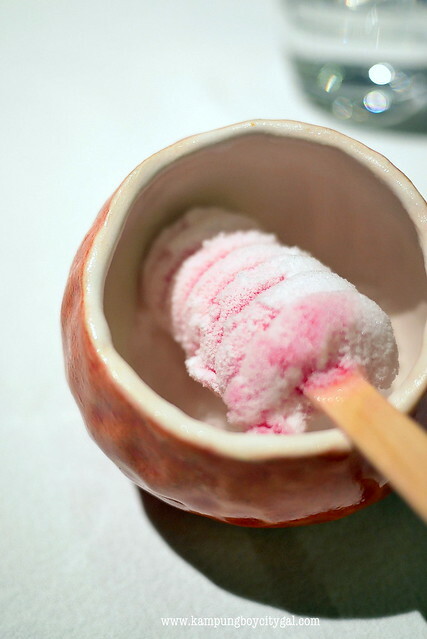 I liked the mix of hot and cold sensation, spicy and sweet taste that tantalised our tastebuds. A must during South Indian Tamil New Year, the mango patchadi is a beautiful balance between tangy, sour, bitter, sweet, pungent and astringent tastes. It goes really well with the pistachios crisps. The fluffy pillow with beetroot and cheese makes us hungry for more. 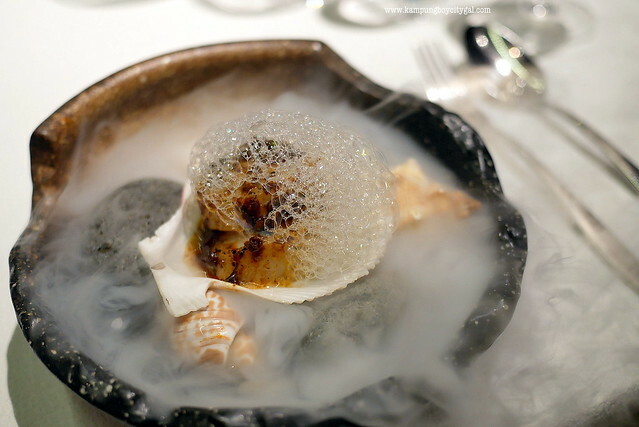 Next up we had the “shell shock” — Hokkaido Scallop with Sodhi. 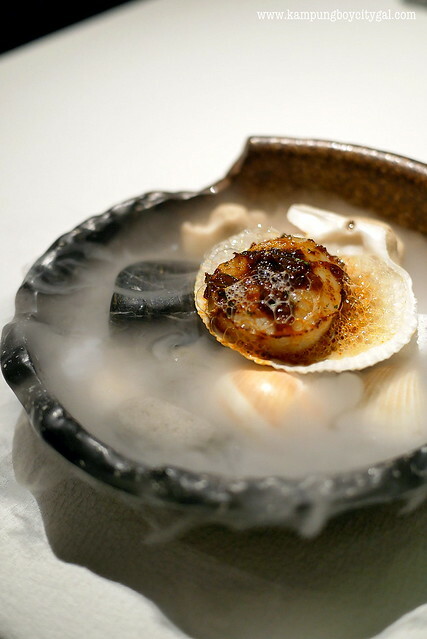 Creamy, mildly spicy and delicious; this is a really unique way to cook up Hokkaido scallop. 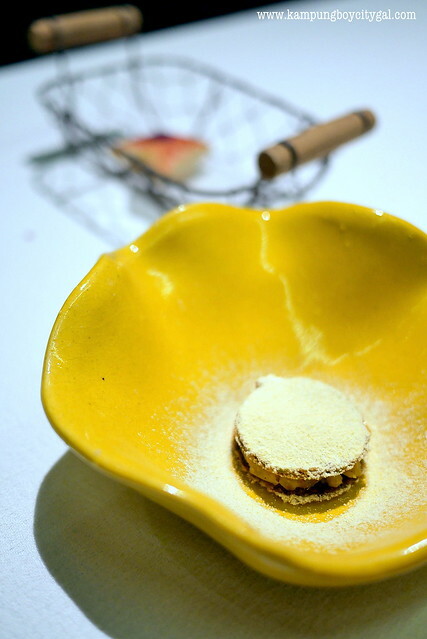 Go Banana was a clever dish that incorporates the stem, fruit and flower of a banana tree. 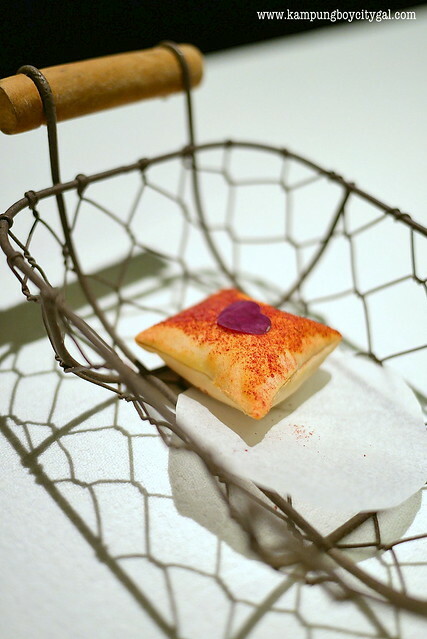 Heads Up is a dish made up of coral trout, head curry espuma, lemon flat rice. 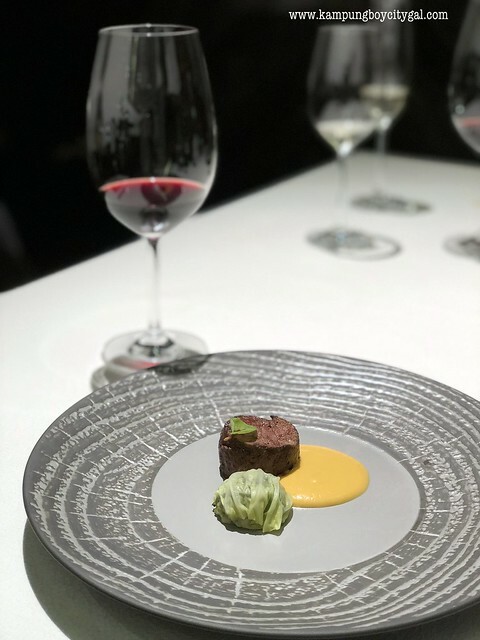 Our dining experience at Nadodi is made amazing because after each courses being served, the respective chef would come out from the kitchen to explain about the dish. For Heads Up, the chef asked us to mix everything up and to scoop from the bottom in order to enjoy this special dish best. 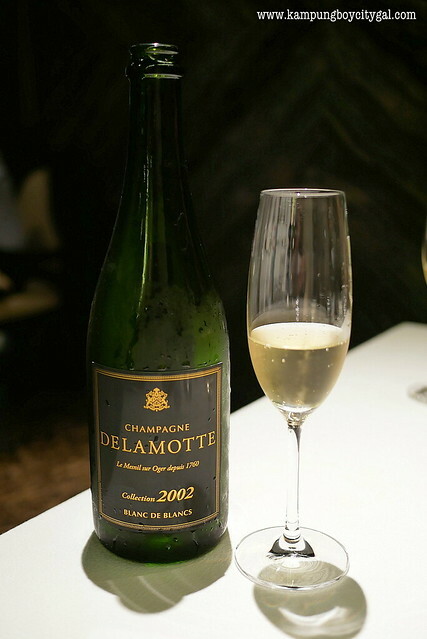 Our glass is being filled with the Delamotte Blanc de Blancs 2002. It has a slight mineral character all come through with a fresh crisp acidity which refreshes the palate. Surprisingly, it goes really well with spicy food. 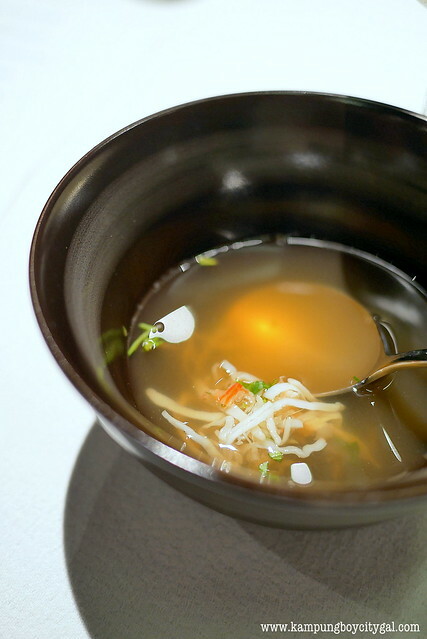 Crabs Day Out – I love the clear, almost consommé like rasam that has a really nice tangy flavour that goes so well with some Alaskan Crab strips. 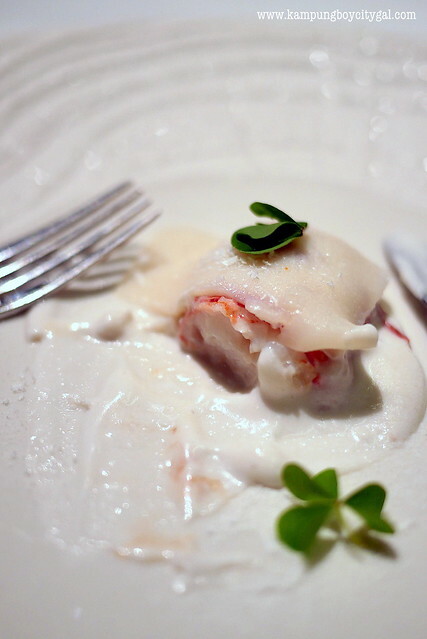 Our palette cleanser is made of Delamotte Rose NV and rose water. 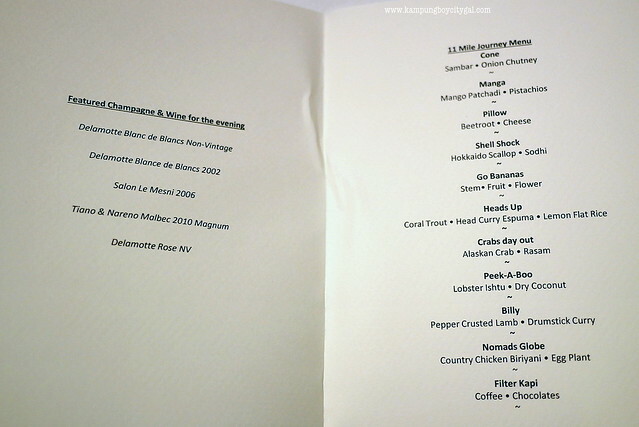 We looked forward to try the Salon Le Mesni 2006 and it did not disappoint. It has a shining silver-golden color, the bubbles are so fine and tiny. 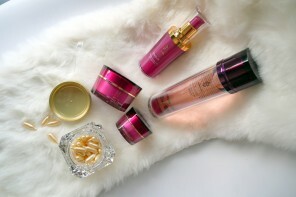 The finish is so clear and aromatic, round and well balanced. Ishtu is a Keralan potato stew dish made with coconut milk, potatoes and onions as main ingredient. 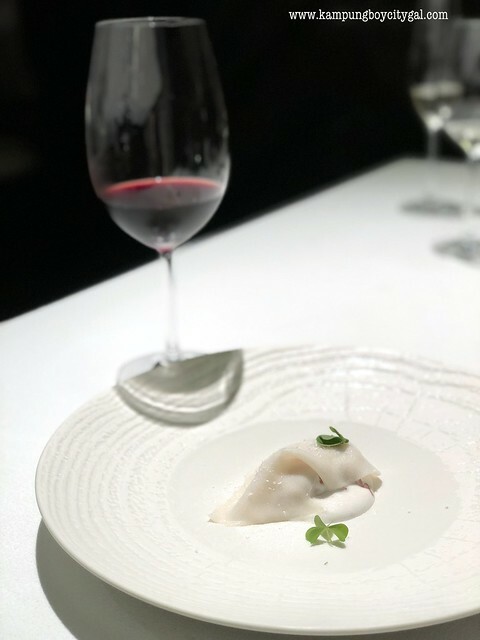 This dish is a beautiful reinvention of the classic Keralan dish, by using succulent lobster meat and a thin layer of scallop skin (!!) 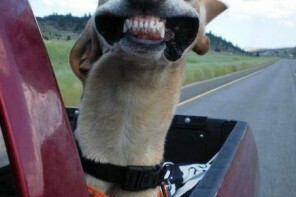 wrap. 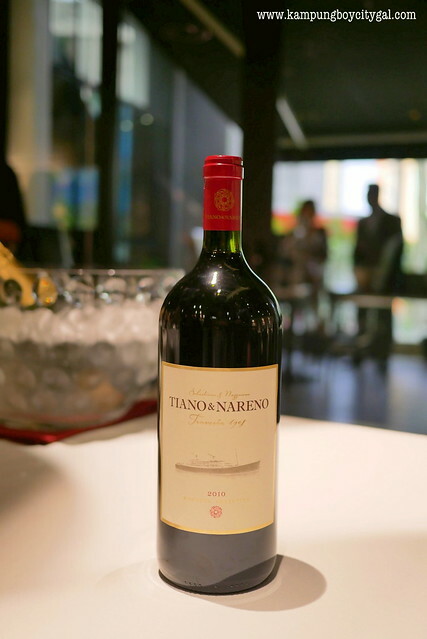 There are only less than 800 bottles (880 bottles produced) of Tiano & Nareno Malbec 2010 Magnum left in the world and we were lucky to be able to try one, all thanks to Didier’s generosity. It has all the classic malbec’s characteristic – powerful, full-bodied with a delicated acidity but with a touch of French elegance, really good. The pepper crusted lamb with drumstick curry was delicious. The lamb was perfectly cooked and the creamy curry sauce added much aroma and flavours to the dish. 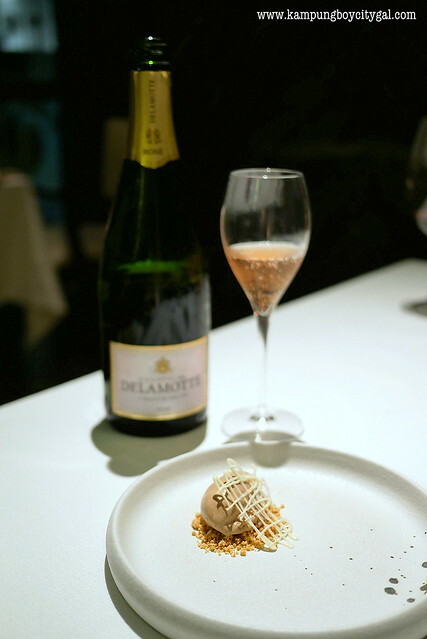 Blogged about our amazing Salon & Delamotte Champagne pairing dinner at @nadodikl. 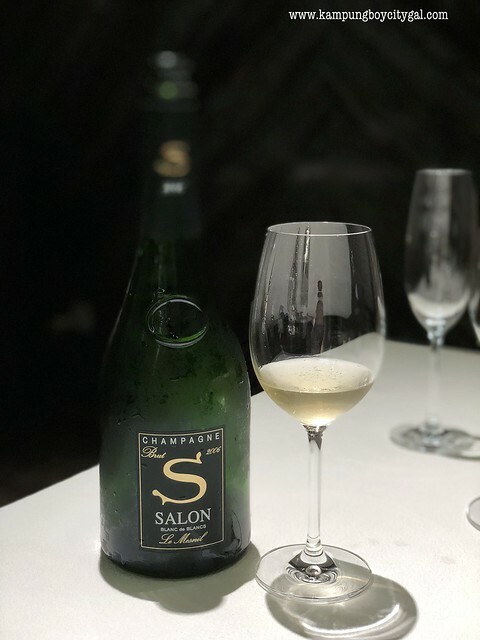 Salon is a unique champagne produced from one single region, single harvest, single cru, single grape variety and single vintage; making it one of the most rare and sought after champagnes among connoisseurs. 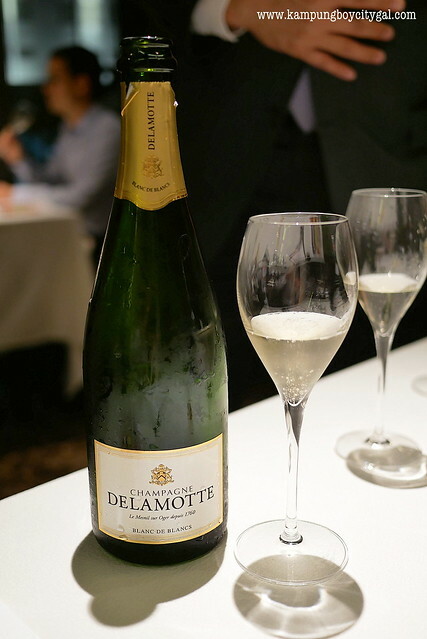 Champagne Delamotte’s grapes are sourced from the vineyards in the Côte des Blancs region as those of the prestigious Salon. Both were great with the engaging nomadic cuisine at Nadodi KL as we took a journey from Tamil Nadu to Kerala and into Sri Lanka. Another main course we enjoyed very much was the Nomads Globe. It is a kampung chicken briyani served with a refreshing salad topped with spheroid that bursts open with yoghurt, plus aubergine in peanut masala gravy. 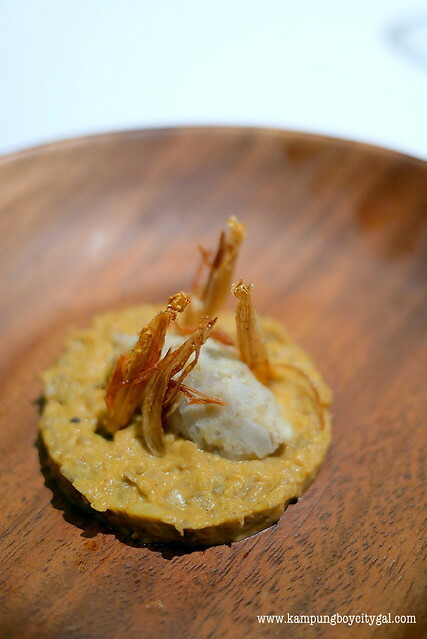 Chef uses a variety of short-grained rice more widely cooked in the Southern Indian region, and it was delicious! We were told to mix everything together to experience an explosion of textures and flavours — smooth, tender, grainy, crunchy and creamy. 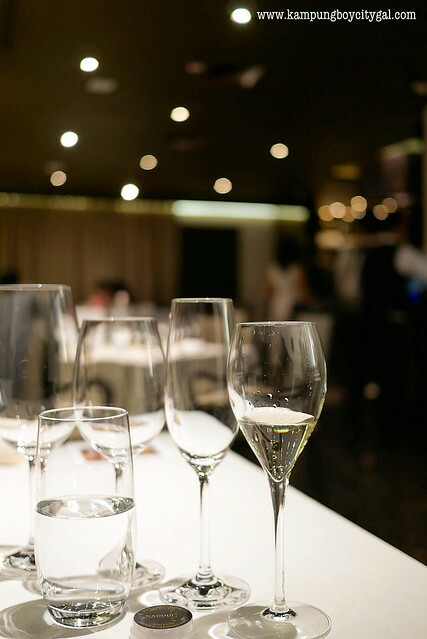 Diineout provides seats for sale for an exclusive champagne pairing dinner like this. 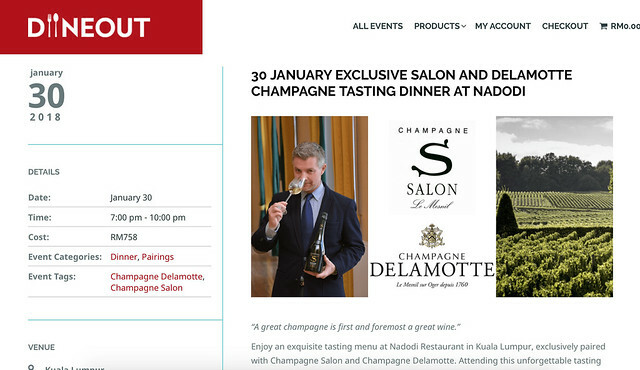 It is such a great value because for less than RM800, one gets to enjoy a multi-course dinner with some of the most rare and expensive champagnes in the world. Do check out diineout for their next dinner event. 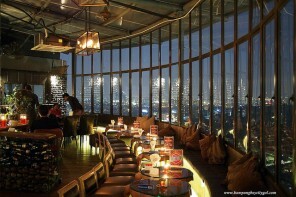 Add: 183, First floor, Jalan Mayang, off Jalan Yap Kwan Seng, 50450 Kuala Lumpur, Malaysia.